Several pundits have declared Nov 19 to be "the" low in this bear market. I doubt it. I would echo one blogger who said the lows may have been made, for 2008. Since Lehman Brothers was allowed to fail a whole new set of dominoes has been set in motion. The rules now are different and a lot of deleveraging is yet to happen. The most recent (last week) news: Citadel LP freezing redemptions, the Bernie Madoff blow-up, a country (Ecuador) is now in default are all telling me that more falling shoes are to be expected with a likely negative effect on the markets which has been ignoring a lot of bad news of late. I've come to believe that at times like these it is best to focus on the technicals which are still pointing strongly down, and be skeptical of newsbytes that sound too good to be true like the recent misleading decline in foreclosures news. I've sold all equities during the "Obama rally" and I remain bearish now with a small allocation betting on the markets to resume their decline after the recent mini euphoria dissipates. I have to add one warning though: doubly leveraged bearish ETF have been very weak of late. There's no more oomph is trying to short the markets using the inverse leveraged ETFs. This is becoming too easy and too obvious so the futures are discounting them. Premiums on puts are very high accordingly. Anyone who is bearish, should be careful here. I personally prefer to short the long ETFs rather than buying the inverse ones. Also: I use the leveraged ETFs only for short term trades, less than a week, and only when they seem overbought. Why am I so skeptical of the recent rally? The markets should turn north about 2 quarters before the economy turns the corner. Given the current state of the economy I believe we have more than 2 quarters before any positive turn would start to emerge. 10% of mortgage owners (not just subprime lenders) are behind on payments or already in foreclosure. 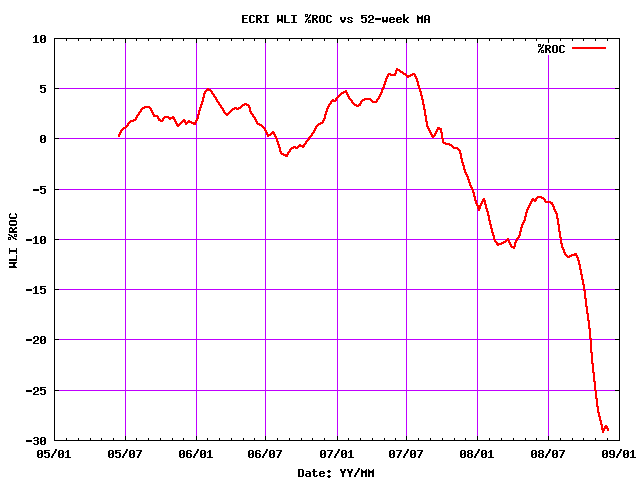 The ECRI "Weekly Leading Index" is hitting new record lows almost every week. Layoffs continue at high (though not record pace) and unemployment continues to rise. The consumer is stretched. From a 6.7% of unemployment, pundits estimate the US should crest at 9-10% or unemployment, meaning there's a way to go still. When the consumer is stretched there's no way corporate earnings can possibly be improving or even stabilize. The Fed is not done cutting rates. Watch for more cuts ahead. After an impressive rally, the dollar is now resuming its decline. On the positive side, I see some strength in the fixed-income ETFs, and as mentioned above a significant weakness in leveraged inverse ETFs. There's no leadership to speak of: around a bottom I expect some sector, or asset class to lead on the way out. In the summer there were some early encouraging signs of leadership (DJ Transports, Small Caps) but they have all given up in the aftermath of the Lehman Brothers implosion. 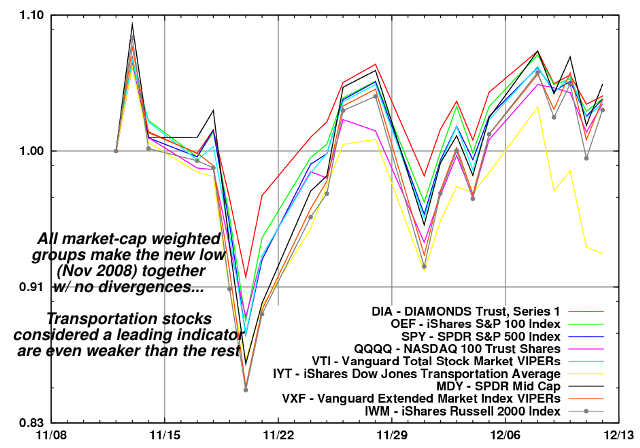 Breadth has been weakening in recent days. The picture is very similar to the weakening we saw after the summer rally from July 15 which eventually turned into a rout. The rally now looks like a slow rollover in progress when looking at the H/L and A/D lines on the US exchanges. Volume was low and unconvincing during the up days. In the most recent low, all broad asset classes gave-in together. Only when a new low in the major indexes would be made with some significant divergence from some asset class it would mark a potential change in trend. The only little rays of light I see are in isolated ETFs like China (FXI, GXC), Japan Small Caps (JSC), but it is not convincing enough to train hop. I'll be keeping an eye on these ETFs because they might well be the leaders of the next bull market, still, I think they have to retest prior lows or support lines first. I've covered some selected country strength in the Nov 22 article. 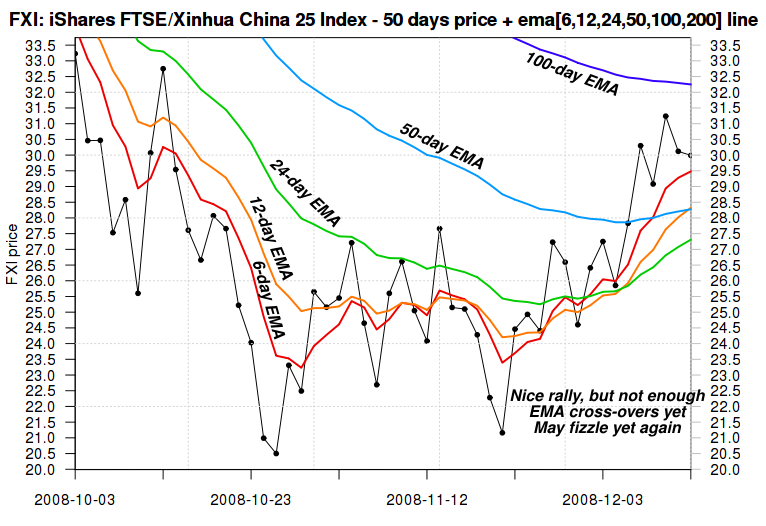 I've seen the fast moving EMAs (5, 10, 20 day) cross the 50 EMAs, but not yet the 50 EMA cross the 100 EMA, let alone a really strong signal like 100 EMA above the 200 EMA. I'm giving up on marketocracy. My limit sell orders there are being ignored even when prices are well above my limits and volumes are much larger than my orders. Delisted ETFs do not seem to get redeemed. Many newer ETFs are missing from their database so I cannot implement my plans. The site is unresponsive and painfully slow. Recently it has been completely down during some critical days in the market. I'm looking for a better alternative. Unfortunately, I had a record of better than 89% of users rank there which I will have to build from scratch in the new place. It is a shame, but I really have no choice. I've released my heatmap software as Free Software, using the GNU General Public Licence (GPL). You can find it here, enjoy. My most important project of developing a short-term trading strategy is progressing well, and initial results show great promise. I'm already using it to trade a small percentage of my real portfolios. Unfortunately, many of the details are too valuable to widely share here so I'm keeping them confidential for now.